I'm sure you've noticed that the Advent and Christmas carols are starting to fill the air. We sang a few at our church this Sunday, among them O Holy Night. He sees a brother where there was only a slave. Love unites those that iron had chained. People stand up! Sing of your deliverance. Recall, the song and French poem were written in 1847. The English version was written in 1855, six years before the American Civil War and eight years before the Emancipation Proclamation. 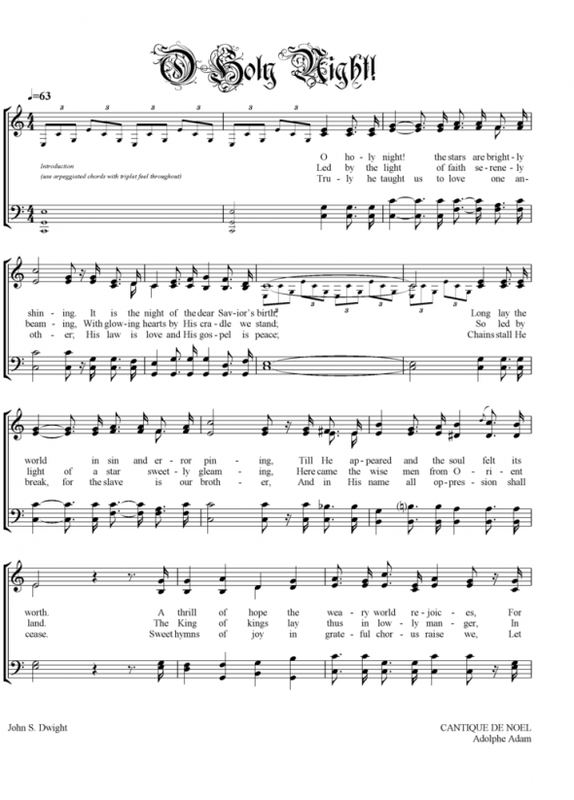 O Holy Night, it turns out, was a song of political resistance and protest. Imagine Americans singing in the years leading up to the Civil War the lyrics Chains shall He break for the slave is our brother; And in His name all oppression shall cease. Great post. I had a preaching professor who had a pastorate in Manila during the 1980s. When he arrive a few generals in the congregation kindly said to him, "You worry about the gospel and we will worry about politics." My professor kindly replied, "Okay" and proceeded that Advent to preach the Magnificat. The generals were not too amused and reiterated their statement: "You worry about the gospel and we will worry about politics." My professor replied, "That is exactly what I am doing." Fascinating. I took a look at the French lyrics and the emancipation spoken of there seems to have been strictly spiritual. The first stanza talks about the "original stain" that was erased and the hope felt that night a Savior was given to us. In the second stanza, the redeemer sees those who were slaves (to sin) and makes them now his brothers, united to each other in love. So, the 1855 American version by the Boston minister John Sullivan Dwight takes that spiritual statement and then makes a deliberate social statement about the slave as our brother and Christ as the end of oppression. Wow. 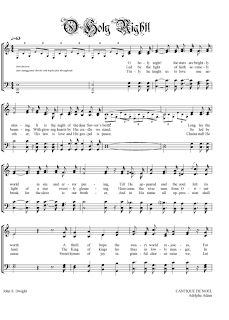 Much preferable as our heritage in song from the Civil War era than the Battle Hymn of the Republic. Ah well, the version I consulted only had two stanzas...so disregard the word "second." Oops, back again. Looks like the French speaks to social order as well, with pretty strong words about the mighty ones and their pride. Who was in power in France in 1847? There was quite a succession of regimes, no? Well, I shall have lots to think about next time I sing or hear this song. Thank you.